Saint Martin, known as the “Friendly Island”, is the smallest island in the world to be shared by two different nations – the French and the Dutch. Here you can find two very different cultures. On the French side, visit the best French restaurants, cafes and bistros, as well as luxury resorts. Stay in touch with the latest French fashion in a very relaxed atmosphere. On the Dutch side you will find casinos and night clubs with a more party atmosphere. Both sides offer you 37 beaches, as well as numerous opportunities to snorkel, scuba dive, hike and kayak. Hop between islands and charter your yacht on St. Martin. 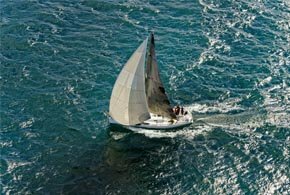 Here, sailing is excellent both for beginners and advanced sailors and skippers. Oh, and do you know that famous beach over which airplanes fly low? It is called Maho Beach and is located on St. Martin! Caribbean trade winds blow from early November until April. The famous Heineken Regatta takes place in early March and you wouldn’t want to miss it. It is held on the Dutch side of the island. Interested in Sailing Holiday in Saint Martin?